Driving in the winter involves more than just driving on slippery and snow-covered roads, and we at Wyoming Valley Kia want drivers to be informed on ways to care for their car while still making winter driving as safe and stress-free as possible. We’ve put together this checklist to help prepare you for winter driving. • Make sure tires are properly inflated and in good condition. • Inspect all headlights, tail lights and warning lights. • Check the battery to ensure its charge is strong. • Check all filter and hoses. • Add deicer into the gas tank during cold weather. • Carry a windshield deicing brush in the vehicle. 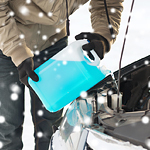 • Ensure that the vehicle has sufficient antifreeze. • Carry an emergency kit with you. If you still have concerns how your vehicle will make it through the winter, stop at the Larksville dealership and have your vehicle serviced by our qualified technicians.